Fantastic tomatoes, planted early and ready to enjoy now. Ibstone has held its village show on the first Saturday in August for many, many years. The week before, locals can be seen checking under the covers of giant marrows and talking softly to tomato plants. Children are busy painting their clay insects and photographers are printing off their favourite pet photo. The W.I. are a fearsome team to behold as chutneys, jams and Victoria sponge cakes are made ready for the 'Best Homemade Product' cup. We learned to expect torrential rain at some point during the day and this year was no exception, however it didn't keep folk away and once again The Ibstone Show had a bumper year. 'The Hintons' took charge of the Produce Stall. We sold our homemade apple and pear juice (which we serve at breakfast time), green bean chutney and fig & walnut loaves, as well as our friends and neighbours' jams, chutneys, cakes, loaves and an abundance of vegetables. There was something for everyone - honey from local bees to help with allergies and posies of lavender to decorate rooms and scent wardrobes. Some serious bartering took place to the tunes of the old organ grinder and the competing cries of joy from winners at the coconut shy and wellie wanging stall. Finally the judging was over and the show tent opened. A great triumph this year for the youngest Hinton who won the Pat Bewick Cup. Whistles and applause went up us as she collected her winning cup from Lady Getty. No better way to end the day with a village BBQ and settle the disputes over the size of ones neighbours' onions! Wild garlic bursts into life every spring and has many peculiar names in England - 'Bear's Garlic', 'Devil's Garlic', 'Gypsy's Onions' and 'Stinking Jenny' are just some of them. It's no surprise that this seasonal ingredient is called so many names - it gives off an incredibly pungent smell in the wild. Unlike common cultivated garlic, it's the leaves that are eaten rather than the bulbs. The taste is more delicate too, similar to the flavour of chives. Place all the ingredients into a food processor apart from the olive oil and blitz for a minute or two then slowly pour in the olive oil until blended. Wild garlic pesto is such a versatile ingredient. You can stir it into pasta or risotto, add to mash, omelettes or soup, for sauces accompanying meat and fish, or simply use for dipping with some delicious bread. Spring has arrived, the daffodils are coming out and the lambs are bleating across the Chiltern again. And for us, at The Hintons, the awaited return of the Red Kites. For many years we’ve had a pair nesting in a tall Beech tree in the meadow. Sadly the strong winds of the Christmas storm blew down the nest. We have started to see pairs soaring overhead, diving and chasing each other with exaggerated wing-beats. This is the first sign of courtship, although they don’t mate until April. 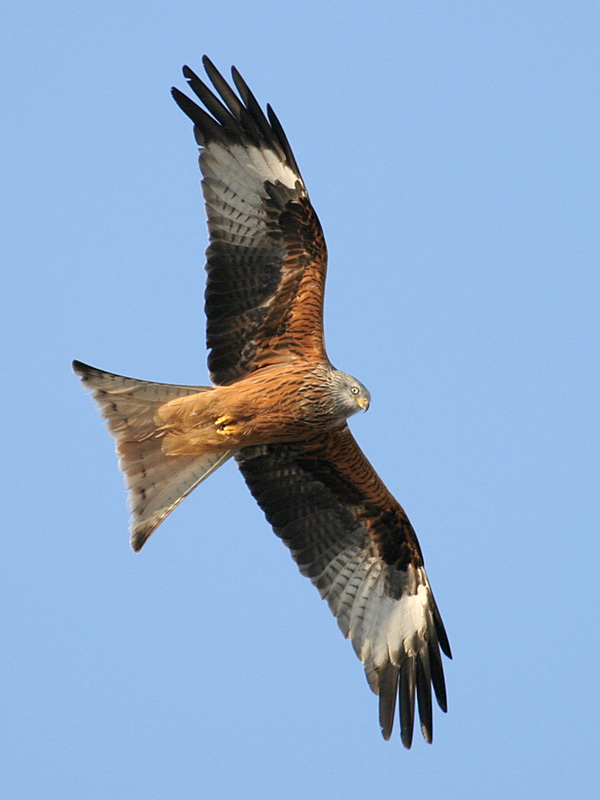 Red Kites usually mate for life. A Red Kites nest is made from large twigs, dried grass and wool however they also decorate it with things they find such as paper, cloth or bits of plastic. Nests looks rather messy and measure around 2 feet across. Our visiting Kites sit in the same tree to eat their prey and drop the bones below each day, we'll keep watching them and hope they start to rebuild their nest soon. 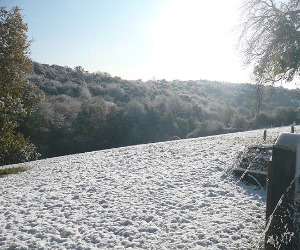 Here in the Chilterns we are 700 metres above sea level so are safe from flooding but very slippery under foot on our lovely walks. Christmas flew by with plenty of activity at the Hintons. We became very creative making our own door wreath from a moss ring with bunches of ivy, bay leaves, holly and fir tree tied into smallish bunches with florist wire and tied onto the moss base. Having covered the wreath with relative ease, we decorated it with walnuts, dried orange and lemon slices and small bundles of cinnamon sticks. The final finishing touches were a few pheasant feathers and a pretty ribbon which made a stunning decoration and ready to hang. One sunny Sunday afternoon we took Oakley for a walk in Parsonage wood and gathered logs and sticks to make our Christmas Reindeer. 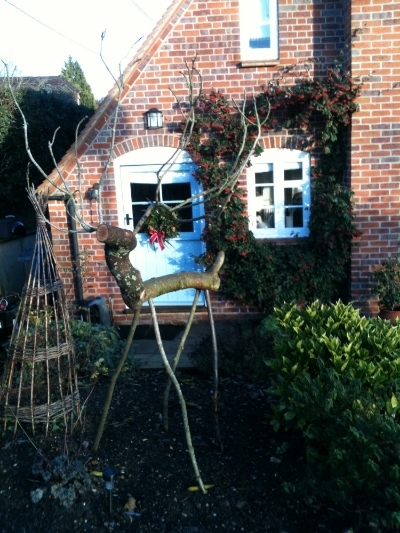 A couple of hours later 'George' stood proudly in the garden looking as majestic as a 14 pointer Red Stag. I’d like to share our secret with you but in truth I just made the tea! The leaves in Parsonage Wood are changing colour, the meadow is full of pheasants and the deer have started their rutting season and bellow down the valley. There is a faint smell of woodsmoke is in the air as I forage the hedgerows for sloes. This is the time of year I start to prepare The Hinton's Christmas Sloe Gin. The sloes come from the common blackthorn hedge found all over the Chilterns. Their bluish black berries are really bitter to taste, have green flesh and a small plum like stone in the centre. 1. Freeze the sloes on a tray to create an artificial frost which also splits the skins. 2. Fill up some washed and sterilised large Kilner jars with sloes. 3. Add approximately 180g of sugar and top the jar up with gin. 4. Seal the lid tight and store in a dark place. 5. Give the jars a good shake every few days until the sugar has dissolved. 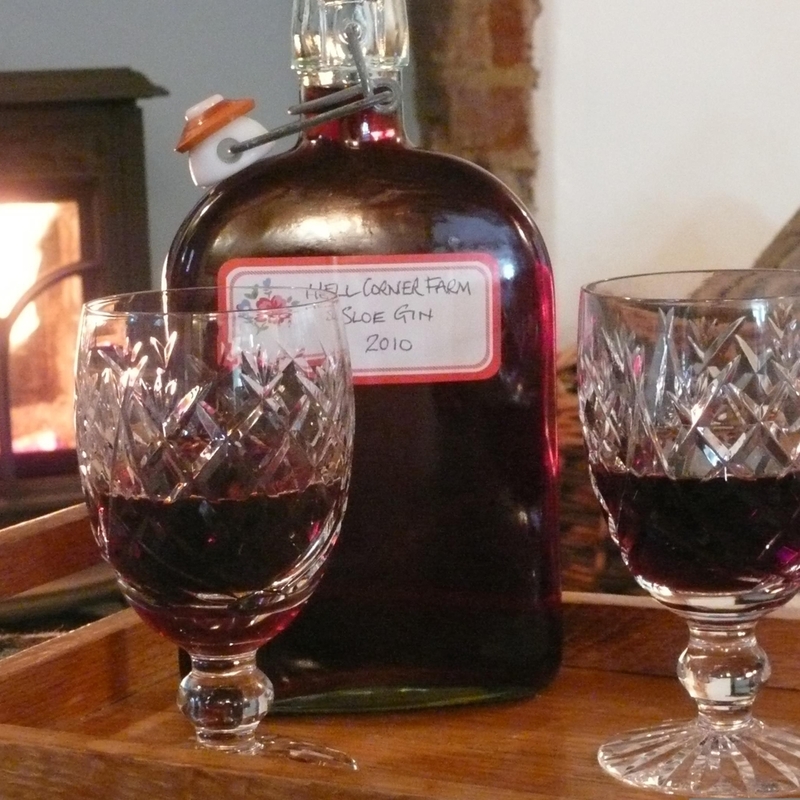 Just before the Christmas season starts I decant 'The Hintons Sloe Gin' into bottles for my guests to enjoy whilst relaxing by the blazing wood burner. We just got back with 90 bottles of The Hintons apple juice from Pasture Farm. This year we combined our cookers, eaters and pears from our very old 'Petit Poire" tree, which produced a crisp, sweet, clear juice. We've made our own label and look forward to serving it for breakfast. As the pears are bountiful but so small we've pureed a lot of them which is delicious with natural yogurt and an autumn family favourite, roast partridge with pureed pears & parsnips served with creamy mash. We've got a bumper crop of apples this year so plenty have been blanched and frozen along with blackberries from the hedgerows ready for crumbles which we not only eat for pudding but are great for breakfast as my recipe is packed with plenty of oats. My freezer is now full of wonderful garden produce so I'm carefully storing some apples in the garage. It's very important to only store perfect apples and wrap them carefully in newspaper and store in cardboard boxes. So all that is left now is to start the chutney ready for Christmas! Our expanded veg garden has done well this summer. 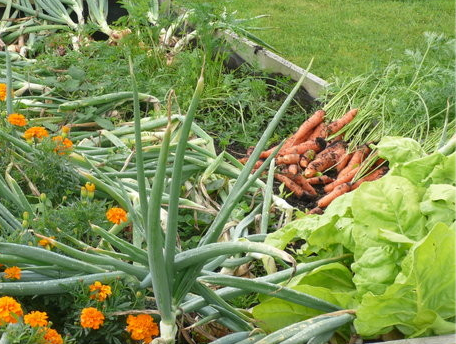 We have been self-sufficient in onions, garlic, carrots, beans and lettuce for a couple of months now. Our tomatoes have been great and we are now over-run with courgettes. Its a good time to record our harvest and plan what to plant next year. Will squeeze in a crop of winter lettuce and spring greens, then get manuring once all the crops are finished. We are putting on a community opera! It is called ‘Road Rage’ and the community cast has ages from 6 to 86 from Ibstone and the local area. The cast also includes children from Ibstone C of E Infant School, Stokenchurch Primary School, Buckinghamshire and Chalgrove Community Primary School, Oxfordshire. We are working with professional Garsington Opera cast members, directed by Karen Gillingham. Road Rage is composed by Orlando Gough with libretto by Richard Stilgoe. The opera will be performed at the amazing open air opera house just round the corner at Wormsley in July. 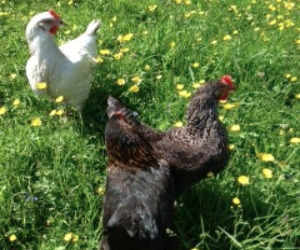 The new hens have arrived! Our six new girls arrived yesterday. They are a real mixture of breeds and characters. They seemed to settle quickly and all put themselves to bed on time! We've already had 5 eggs which should make a lovely cake this afternoon. In return, they loved this mornings's porridge scrapings and a handful of toast crusts. We'll let them out into the meadow next week once they know where they are. The red kites were out flying high in the sun this afternoon. In the spring they nest in our beech woods and sometime we see more than 10 circling above the house and woods. Today they were very vocal with their 'mewing' sounds. They are all busy selecting mates now its the breeding season and were showing off quite blatantly, ducking and diving. Visit www.redkites.net for more info on Red Kites in the Chilterns. Woke up to a snowy world again this morning. The meadow looked beautiful looking across to Parsonage Wood. You could really see why the Chilterns is designated an Area of Outstanding Natural Beauty (AONB)!